Well, there are just certain movies I should have reviewed by now. I’ve mentioned on multiple occasions how much I like prisoner of war movies like The Great Escape and Bridge on the River Kwai, but the first one to really put the WWII sub-genre came along in 1953, Stalag 17, a classic that doesn’t always get its due. It’s nearing Christmas in 1944, and a breakout is planned in Stalag 17, a German prisoner of war camp deep in Germany for Allied fliers. The night of the escape, the two prisoners making the attempt are machine gunned outside the barbed wire fence, leaving the prisoners they left behind in Barracks 4 to question what’s going on. How did the Germans know details of the escape? The prisoners look to J.J. Sefton (William Holden) as the culprit, a possible stoolie who trades and bargains with the German captors for all sorts of luxuries from eggs to cigarettes to booze. Maybe Sefton has been giving away all their secrets for his own benefit, but Sefton knows otherwise. He may be a chiseler, but he’s not a traitor. The problem is simple though, he can’t prove it. Who among the other prisoners in Barracks 4 is the real culprit? He’s going to need an answer and need it quick before his bunkmates decide they’ve had enough of him for good. From director Billy Wilder, ‘Stalag’ is a gem of a film, one of my favorites going back to when I was a kid. It was based on a Broadway play that had 472 showings over its run. The stage-based play roots are obvious, but in a good way. Filmed in a very appropriate, very effective black and white, ‘Stalag’ is set almost entirely in Barracks 4 as the story develops, Christmas approaching ever quicker. The only departures we have from the barracks are outside into the camp compound. We never leave the camp, the entire story based in Stalag 17. The crowded, claustrophobic barracks becomes another character with the bunks almost bumping into each other, the windows with the frost and ice sticking to the panes, the clothes hanging from lines hung from wall to wall. Franz Waxman‘s uncredited score is solid as well if underplayed, Johnny Coming Marching Home a key component of the story as well. One of three nominations the movie received went to William Holden as Barracks 4 chiseler and general trouble-maker J.J. Sefton. Nominated for his part in Sunset Boulevard but not winning, Holden got a much-deserved win here, taking home the Oscar. More impressive? He was going up against Burt Lancaster and Montgomery Clift in From Here to Eternity. Holden brings this character to life, a less than sympathetic but still appealing individual who’s decided to make the most of his prisoner of war status. He’s going to live in comfort, and if that means dealing/trading with his German captors, then so be it. It’s not an issue until his bunkmates decide he’s the traitor giving the Germans all their secrets. This is where Holden’s acting steps up a notch, a desperate man now fighting for his survival instead of his personal comfort. Not often remembered as one of his best, but it’s a goodie. Holden’s performance comes as part of a very solid ensemble cast that doesn’t feature a ton of A-list stars, instead turning to a group of familiar character actors. Start with Robert Strauss as Animal and Harvey Lembeck as Harry Shapiro, the barracks cut-ups, Richard Erdman as Hoffy, the barracks chief, Peter Graves as Price, barracks security, Neville Brand as Duke, the hothead, and Gil Stratton as Cookie, Sefton’s mousey assistant, and Robinson Stone, Robert Shawley, and William Pierson rounding out the bunch. Don Taylor co-stars as Lt. Dunbar, a prisoner in transit who comes under SS questioning, Jay Lawrence his impersonating, smart-mouthed traveling companion, Sgt. Bagradian. The comedy between Animal and Harry gets to be a little much at times, Bagradian’s impersonations a little forced, but as a collective whole it’s a good, strong, deep group of interesting characters. It is hard to watch this without seeing the obvious influences some 10-plus years later with TV’s Hogan’s Heroes. Director Otto Preminger stars as Von Scherbach, the Stalag commander, an old-school German aristocrat and gentleman while Sig Ruman plays barracks guard Sgt. Schulz, a VERY obvious influence on John Banner’s famous Sgt. Schultz character in the TV show. 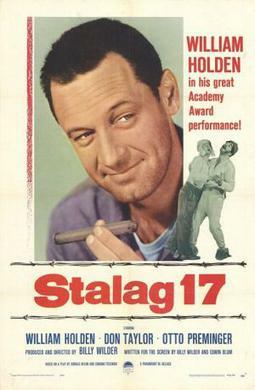 An episodic story that clocks in at exactly 120 minutes, there really isn’t a slow moment in Wilder’s Stalag 17. In directing his film, Wilder decided to shoot chronologically so that way the cast and crew wouldn’t know the twist — the identity of the barracks traitor — until the end of filming. The first hour or so of the movie blends the drama and comedy nicely setting up the second half of the movie. As the barracks traitor story comes to the forefront, that’s when ’17’ is at its best. The last 30 minutes are pretty perfect, Holden’s Sefton starting to piece the clues together in a great couple scenes, Wilder’s talent fully on display in shooting style, while the actual reveal and the finale are spot-on. This is a movie that doesn’t always get the recognition it deserves, but it sure deserves it. One of my favorites.